) NRIs for NRIs: Who knows better the pain, anxiety and emotion of a NRI than a fellow NRI. The two developers of Rosedale are from USA with 40 years experiences, committed to make a difference. Shrachi Group, well-known local partner also with them. b) Location: Rosedale is a Garden Apartment Complex in a modern planned city, a future of Kolkata. It is not a 'sub-zero temperature in a blast furnace'; outside of Rosedale Complex is not-congested, no pollution. Newtown is open and airy with greeneries, lakes; far from noise and pollution, dust and smoke. Rosedale Garden will provide the cosmopolitan lifestyle with rural flavors. It is near to Airport, Saltlake City Center. You reach Rabindra Sadan faster from Rosedale Garden than Southern part of present Kolkata. c) Government Partnership: HIDCO (Housing Infrastructure Development Corporation), a subsidiary of WB Government will monitor the construction and safety aspects of the project. The accountability from the construction companies will be best with direct Government involvement. HIDCO will transfer the apartment ownership papers directly to the legal buyers. You get Free and Clear ownership paper, hassle free! e) Credibility: Understandably, NRI developers are successful in their own professional fields, and new in the housing development project with unblemished resume; they have many friends, well-wishers, role models in Kolkata and abroad. Many dignitaries such as (Ex) Chief Minister and Housing Minister of WB Government, US Consul, Secretary Maharaj of Ram Krishna Mission, Swami Jitmanandaji, Police commissioners, MD of HIDCO and many NRIs as distinguished guests were present at the inaugural ceremony of Rosedale Complex. Different news media gave raving reviews of the novel residential complex for NRIs by NRIs. Hello Sir/Madam, This is Subir Banerjee from MMG Realty, Kolkata.We have just launched our one of the bigest project in Kolkata named Culcutta Riverside. It's a massive project over 262 acre of land.This is a joint venture between Bata and Highland along with Calcutta Metropolitan Group Limited (CMGL). Plz find Details of this Project------------- *Calcutta River Side*. In This Township there will be three types of Condominiums one the river fcaing, the lake facing and the other facing the golf course. THE DEVELOPER :*Calcutta Metropolitan Group Limited (CMGL)* is owned and promoted by Kolkata Metropolitan Development Authority (KMDA) and United Credit Belani Group (UCBG), who enjoy an equal stake. 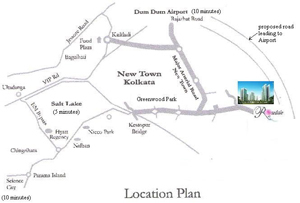 KMDA is engaged in the planning and development of Kolkata Metropolitan Area. The Town and Country (Planning and Development) Act, 1979, has designated KMDA as the statutory planning and development authority for the Kolkata Metropolitan Area. UCBG comprises of the United Credit Group and Belani Housing Development Limited. The principal business activities of UCBG are asset financing, real estate development and capital market intermediation.Having created some of the most reputed projects in the city of Kolkata, the United Credit Belani Group needs no introduction. Neelkanth, Neelkamal, Trimurti, Himalaya House, India House, Continental Chambers, IDBI Building, British Deputy High Commission, Queens Court, Metro Towers, Garden Apartments and Commercial Point are some of their famous landmarks. Not ready to rest on its laurels, the company has a number of prestigious projects in queue. The Bengal Lamps project at Prince Gulam Shah Hussain Road and the 309-acre township at Batanagar are indeed worthy of mention. *Project Overview* :Riverbank Holdings Pvt. Ltd is developing the sprawling 262-acre, Batanagar, located on the South-western fringes of the city into a modern township-Calcutta Riverside to commercially exploit the additional land available there. Located on the eastern bank of the river Hooghly, the site provides a natural serene setting to the development (primarily residential, leisure and recreational activities). *History*:Calcutta Riverside will retain the intrinsic character of the city. Yet there will be a contextual interpretation of this character, the outcome being a residency that's contemporary in nature and yet reminiscent of an urban fabric that's unmistakably Calcutta. *Maheshtala Municipality (inside Kolkata Metropolitan Area). *The site is 9 kilometers away from Taratala intersection. *15-16 kilometers away from Central Kolkata *(Esplanade/ Dalhousie). The site can be accessed through road, suburban rail as well as through river Hooghly - thus enjoying multi-modal connectivity. * B.B.T. Road. The site is also *connected to Behala residential suburbs through Biren Roy Road and to Gardenreach / Metiaburuz area through various linkages. 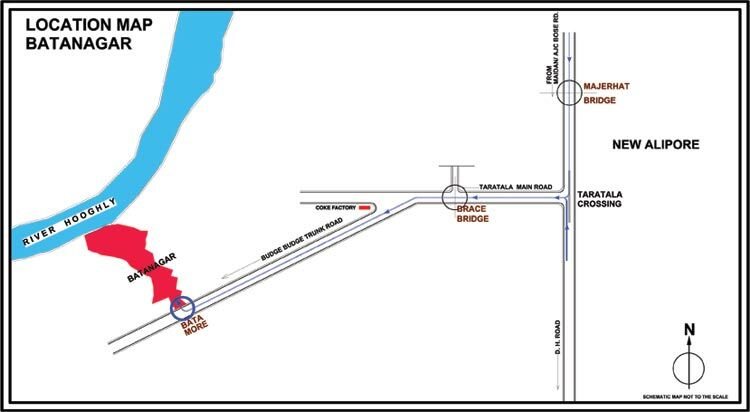 *The Budge-Budge Trunk road is currently undergoing improvements, which will further enhance accessibility. *The site is located on the *eastern bank of Hooghly River and enjoys a 500 meter wide river edge. * The image of serene natural environment along the riverbank provides excellent setting for residential development away from the hustle-bustle of the city - therefore, offering comparative advantage over all other developments. *Within the Complex* :Calcutta Riverside maintains a healthy balance between the residential and commercial, without disturbing the ecological balance. Companies that choose to make the IT Park their base will have access to a cafeteria, semi-covered terraces on each floor and a host of restaurants and food courts. In addition to the above, there will be three levels of car parking along with supporting infrastructure and services. # Transport hub with non-polluting transit services for internal circulation within the township, bus terminal providing connectivity for the site to the city and taxi stands. # Informal market integrated with the transport hub. # A large landscaped plaza ( 2.5 lac sq.ft) between the retail mall and the IT Park. # A 25m wide pedestrian walkway/jogging track. # Three existing temples that would be retained. # Existing and proposed school. As I told you that there are three types of Condominiums available. A) The River Facing, name is Princep. We have launch a single tower of G+26height. The soft launch offer is Rs 2200/- per sqft for any floor. The area range is from 1935 sqft to 3212 sq.ft. B) The Golf cource Facing, name is Golf green. We have launch three towers of height G+6, G+7 and G+8. The soft launch offer is Rs 2050/- per sq.ft. The area range is from 1665 sq.ft. to 3053 sq.ft. C) The Lake facing,Name is Lake Town . we have lanched 5 towers, The soft launch offer is Rs 1900/- per sq.ft. The area ranging from 1578 sq.ft. to 2086sqft. The heigt of the towers is G+6, G+4 and G+7. No floor rising is charged now. For example one can book a appartment in Princep in any floor for Rs 2200/- per sq.ft.Kindly let me know which type of condominuim you will go for. According to that I will send you the further details of the type of condominium you like the most.